While Christmas in Japan is all about fried chicken and strawberry shortcakes, our holiday season catch-ups - here in Melbourne - tend to be around the konro (Japanese grill). 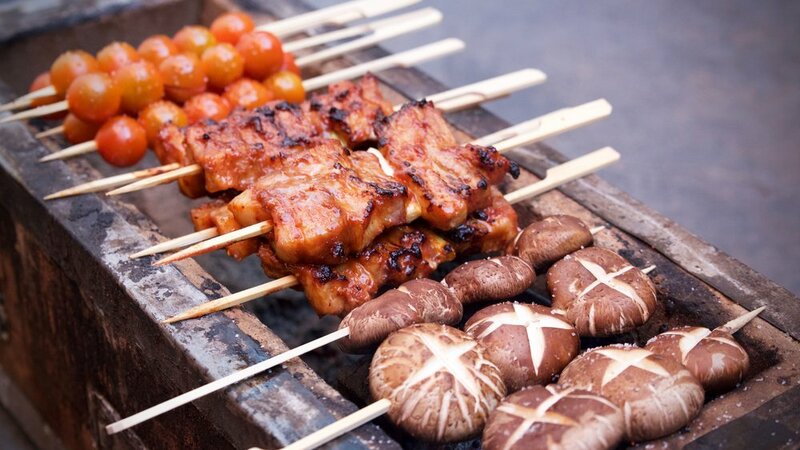 This is our recipe for Yakiton, or grilled pork belly skewers, with a miso & gochujang (Korean chilli paste) marinade. The miso and gochujang form a salty, slightly spicy coating that caramelises and chars just a little bit over the charcoal; delicious with the succulent pork belly. Grilled cherry tomatoes and shiitake mushrooms are optional. The night before, soak the wooden skewers in water. Combine the marinade ingredients in a large bowl. Cut the pork belly into 5cm wide pieces and coat with the marinade. Cover and refrigerate for two hours. Meanwhile, light your charcoal as per the instructions. After two hours, thread a piece of pork belly onto each skewer, followed by a piece of spring onion, then two more pieces of pork belly. Prepare a heatproof brush and place the oil in a bowl to brush the pork belly skewers with while cooking. Place the pork belly skewers approximately 5cm over the hot charcoal and cook, checking regularly to ensure it is not burning (we cooked ours over a konro - Japanese charcoal grill - without using the mesh). Brush with oil every 2 minutes. In the meantime, mix together the garnish ingredients. Once the pork is cooked (cut a piece to check the centre if unsure), remove and serve piping hot with the garnish. Recipe & images copyright of chotto. For a yakitori recipe, you'll have to wait till Tokyo Local hits the shelves!